San Diego's Thomas Marcus runs following a catch in the second quarter. When he interviewed for the San Diego High head football coaching job, Charles James was posed a seemingly peculiar question. “Will we score points?” asked a parent. Which offers a hint to how low the historic and once-mighty Cavers had spiraled. In the two years before James took over in 2015, San Diego was a combined 1-18. Average score: 44-5. Blanked in 12 of the 19 games. Flash forward to the present. The Cavers are 5-0. If they win tonight against Classical Academy — and they’ll be Alabama vs. Our Lady of Peace favorites — the Cavers will be 6-0 for the first time since 1958. Better believe it. The Cavers have done it with a core of 14 varsity players. After every junior varsity game, about 10 JV players whisk to a locker room, change into varsity threads, providing special teams and backup reinforcement. It helps that in that Band of 14 Brothers there are some very good football players. Junior running back/linebacker Raiden Hunter is your classic 5-foot-9, 190-pound, I-wanna-hit-you, high school football player. Sitting in the Cavers’ concrete grandstands, Hunter, who carries a 4.25 grade-point average, playfully took slight offense with Orfanos’ description. “I can move a little,” he said. James thinks Hunter is the best junior running back in the county. Then there’s safety/running back/kicker Jayden Wickware, a slasher with the football in his hands. Hunter averages 8.7 yards per carry, Wickware 8.6. 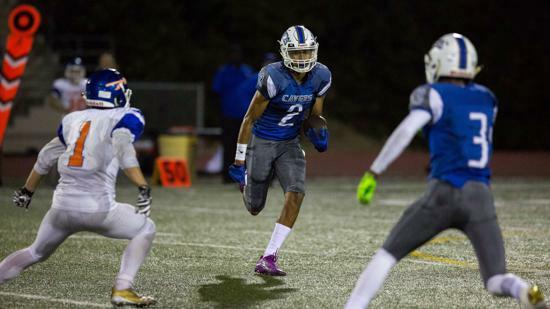 On any football team’s success some good luck must fall and for the Cavers that manna arrived in the form of a 6-3, 185-pound wide receiver/quarterback/safety/punter/kick returner, Thomas Marcus, who has been offered a scholarship to Arizona. Marcus was the starting quarterback last season at Horizon Christian Academy and accounted for more than 2,000 yards and 24 TDs for a Panthers team that won the Division V title. But Horizon shut down and Marcus high-tailed it to San Diego. He considered St. Augustine. “I knew they were losing people. It wasn’t the same team,” he said. He considered Mater Dei Catholic. “I didn’t know who they had,” he said. But he knew about San Diego. His parents are close friends with James. And in Marcus, the Cavers landed a freakishly talented athlete, San Diego County’s most talented athlete, in James’ opinion. Marcus averaged more than 19 points a game for Horizon’s basketball team last season and played for one of the nation’s best travel basketball teams last summer. When he lines up at quarterback, Marcus unwinds his left arm and uncorks tight spirals. Taking the ball in the shotgun, he pulls off Marcus Allen imitations, letting the defense spread, then darting about the crevices. But it’s at wide receiver where he’s most dangerous and being recruited. He’s averaging 25.1 yards per catch. Seven of his 25 receptions have ended in the end zone. Skill position players are nice, but you need blockers and tacklers. That’s where the 5-11, 190-pound Orfanos comes in. He tops the team with 47 tackles — Hunter is second with 39 — and leads the offensive line. Success, in business and sports, bleeds from the top, which steers the story back to the 38-year-old James. He works at Morse High as an instructional behavioral technician, meaning he works with students who have struggled academically. He was the head coach at University City for two years, his 2014 team compiling a 7-5 record. So why leave UC for struggling San Diego High? He grew up in North Park and played for Balboa Pop Warner, which played its home games in Balboa Stadium. By middle school, he was a water boy for the Cavers’ varsity. During practice breaks, former Cavers quarterback Jacque Jones, now a Washington Nationals hitting coach, tutored Charles on the art of running the option. James was a do-it-all freshman on the Cavers’ 1994 varsity, the last San Diego team to open 5-0. “When you see San Diego High losing, some really bad losses where it was embarrassing … I didn’t want us to be embarrassed,” he said. Amid this about-face season, he has heard from numerous alumni. San Diego High opened in 1882. The Cavers’ first football season was 1891. Those 1891 Cavers wore blue denim jeans and white shirts, hence the blue and white school colors. Ezell Singleton, who appeared on the “Ed Sullivan Show,” plus Art and Charlie Powell starred at the school. They played before crowds that swelled to 20,000-plus inside Balboa Stadium, unquestionably San Diego’s most famous sports venue. The Beatles and Jimi Hendrix played Balboa. Presidents Woodrow Wilson and Franklin Roosevelt spoke there. Charles Lindbergh was honored there. Babe Ruth, Lou Gehrig, Ted Williams, Jim Thorpe, Jim Ryun, Bill Tilden, Jesse Owens and A.J. Foyt all performed at Balboa, as did the 1963 AFL champion Chargers. “It feels good to play where great things have happened,” said Hunter.